Sam Lawson knocks a gate out of the way during his slalom race at Alpine Meadows Feb. 1 earning second place out of 31 racers. 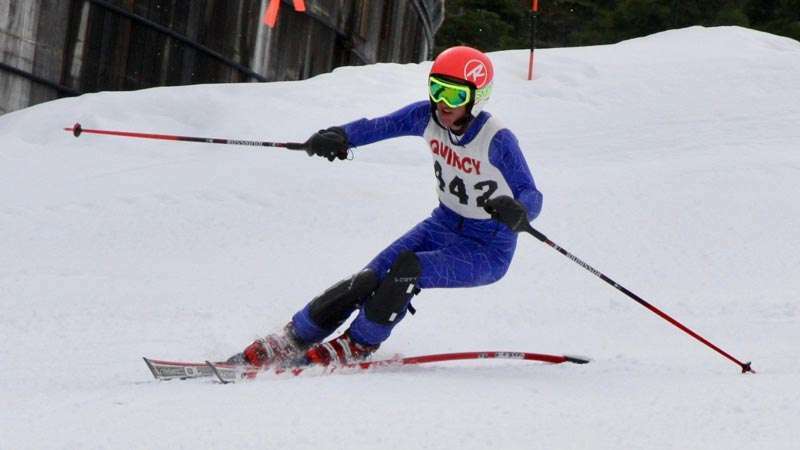 The small but mighty Quincy High School ski team continued to challenge larger school competitors with top finishes in two races last week in the Central 1 Division. 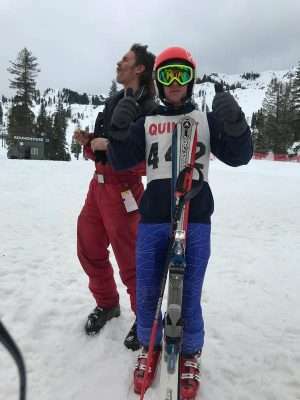 In the slalom race at Alpine Meadows on Feb. 1, junior Sam Lawson took second place out of 31 skiers for the boys, while sophomore Sabina Winter pulled off third place out of 25 girl skiers even after a slight stumble on her second run. Winter had the fastest time on the hill out of both boys and girls. She skied her first run in an amazing 43.82 seconds and had nearly an 8-second lead over the second-place finisher from Chico, who ultimately won the race after the second run. Winter’s combined time was 1:45.99. Lawson faced tough competition from Sacramento, Chico and Loomis skiers but with two clean runs landed in second with a combined time of 1:36.37. QHS junior James White was in 17th place after his first run but a slip on the second run landed him in 21st overall. Sophomore and first-year racer Payton Peters came in 25th after two clean runs. 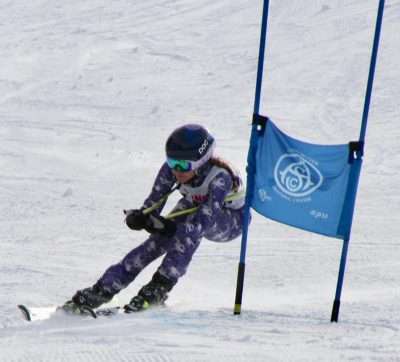 The QHS skiers also competed in a giant slalom race at Northstar on Jan. 31, where Winter dominated and took first place out of 25 girls with a combined time of 2:38.73. Her combined time was an impressive 9 seconds ahead of the second-place finisher from Chico. In the boys’ race on Jan. 31, Lawson landed in fourth place out of 31 just seconds behind Chico High and Sacramento Country Day School skiers with a combined time of 2:46.71. Ski team head coach Max Egloff clowns behind QHS racer Sam Lawson at Alpine. Coach is always trying to teach the team to have fun while they work. White and Peters both had clean runs down this longer course with White ending 21st and Peters ending 29th. The ski team will return to Alpine Meadows for another slalom race this Friday, Feb. 8, and again on Monday, Feb. 11, for giant slalom. Max Egloff, a former QHS ski team racer, is coaching the Trojans for a second year. Elliott Smart joins Egloff and the team as assistant coach. Some years ago as coach for the Johnsville Junior Ski Team, Smart taught many of the Quincy team members the arts of skiing and racing. Lawson, Winter and White all skied with the Johnsville Junior Ski Team as young children. Conversely, Peters stood on top a pair of skis just a few times before joining the QHS team in competition. The Quincy High School Trojan ski team trains at Boreal Ski Resort with both weekend and night practices. They also train by working out after school at Feather River Fitness.